In this the second article in a series on the Return of Quetzalcoatl, Carl Johan Callesman, one of the world's leading authorities on the Mayan Calendar, discusses the idea that Quetzalcoatl, the ancient Mexican deity, is a true saviour figure. He argues that there could well be a divine plan revealed in the Mayan Calendar, which comes to fruition in the near future. Quetzalcoatl, the Plumed Serpent, was seen in ancient Mexico as the deity that created the calendar and the civilization. To many, equating the importance of the calendar with that of civilization may seem to overestimate the importance of the former. This is because time has become a blind spot in the worldview of modern man. In reality, the calendar is just as important as the civilization as such, since the calendar is what provides the worldview of a civilization. The reason most people do not realize this is simply that modern civilization has the calendar that it deserves. In today's materialist civilization, calendars are almost without exception based on astronomical cycles, cycles of material bodies, such as the orbits of the Earth around the Sun or of the Moon around the Earth. Few people even consider the possibility that a spiritual calendar unrelated to such physical movements might exist. What, or Who, is Quetzalcoatl? What, or who, then is Quetzalcoatl? Why would the ancient peoples of Mexico worship, and long for, a "Plumed Serpent" who would bring the light? The reason is that this Serpent was a symbol of the duality that always accompanies the generation of new Yin/Yang-polarities in the cosmic plan. Since the introduction of Yin/Yang dualities at longitude 12 East (which separates the Western and the Eastern Hemispheres) always brought some light, Quetzalcoatl was also seen as the bringer of this. 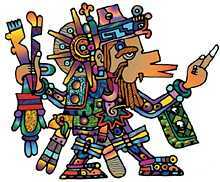 Since America is located in the Western Hemisphere and Quetzalcoatl was associated with the World Tree trunk at longitude 12 East, he was in ancient times perceived by Native Americans as an energy appearing in the East, from where he was also one day to return. Part of the purpose of the Oneness Celebration is to recreate the energy of Quetzalcoatl along this line. Also in many other traditions the Serpent was seen as a symbol of duality. The Biblical theme of the Serpent and the Tree of Life, or the Norse of the Dragon-Serpent Nidhögg coiling around the World Tree Yggdrasil, are really describing the same reality as the old Mexican of the Cosmic Serpent and the World Tree. The planet Venus, which passed through its alternating phases of morning star and evening star, light and darkness, was also associated with duality and hence with Quetzalcoatl. The 13-baktun Long Count of the Maya was sometimes referred to as the "Birth of Venus", which was a natural name for the introduction of the cosmic duality that created the first higher civilizations of humanity at the beginning of this Count about 5000 years ago. The insight that we human beings live in a reality created by Divine Intelligence evolving according to a pre-set Cosmic Time Plan. Above all, this is a calendar that proves that God exists and that we have a higher purpose. The calendar as such gives life a higher and deeper meaning. Doubt and belief give way to hope and inspiration provided by the knowledge of the true destiny of humanity. This promise has important consequences. If we are here for a reason and if there is a deadline within which the destiny of humanity should be fulfilled, then we have to assume responsibility on a new level; responsibility for ascertaining that we attain our common spiritual destiny. Such responsibility includes protecting the Earth and its life forms. Being co-creators of the divine plan or, gods in becoming, will no longer be just "nice thoughts", but our very reality. If we want to be part of fulfilling the Divine Plan, then our spiritual destiny will need to be taken into account in all planning of the future. At present this is the only realistic approach to life and we will need to chose the course of our lives based on whether they are consistent with the Divine Plan or not. A unified view of looking at the world, one where science and spirituality merges into a Theory of Everything of a very simple basic structure. This will create a deeper understanding of the universe in all of its aspects. All phenomena become understandable from the evolution of consciousness according to a pre-set plan. Read part two of The Plumed Serpent, where Carl discusses the idea that there is a Divine Cosmic Time Plan, revealed in the ancient Mayan Calendar.